Box Dimensions (LxWxH) 6.0 x 3.8 x 3.7"
MH-18a Quick Charger for EN-EL3 Series Batteries is rated 4.9 out of 5 by 158. Rated 5 out of 5 by Fishsticks-n-tatertots from Outstanding in its simplicity This charger is the factory-supplied model for many Nikon cameras, as it was for my D90. When my original charger went missing, this was the obvious choice -- I like to keep my setup all Nikon. The battery fits into the charger securely, and the built-in light lets you know where you are in the process (charging or done). The power cord detaches for easy stowage. If there's a drawback, it would be that said power cord is designed to be plugged into an outlet only -- no USB capability. I don't find that to be an issue. If I need to charge batteries in the car, I just plug the charger into an inverter that plugs into the lighter outlet. Rated 5 out of 5 by Dean P. from This Little Guy Delivers I purchased this unit as a backup in case the MH-18a that came with my D300 body dies, or if I very quickly need to charge all of my batteries. I do not think my original charger will die, however, as this sucker is rugged. It has been dropped, kicked, shoved unmercifully into bags of all types, the cord has been rolled over by my office chair several times. It has put up with sunlight, damp conditions, dry conditions, heck, it even survived my chihuahua's attentions. Yet, it keeps on working. Charging batteries left and right without a single complaint escaping its lips. It is my understanding that according to some belief systems, if you were to be reincarnated in the form of an MH-18a, it means you led a good and virtuous life in the past. 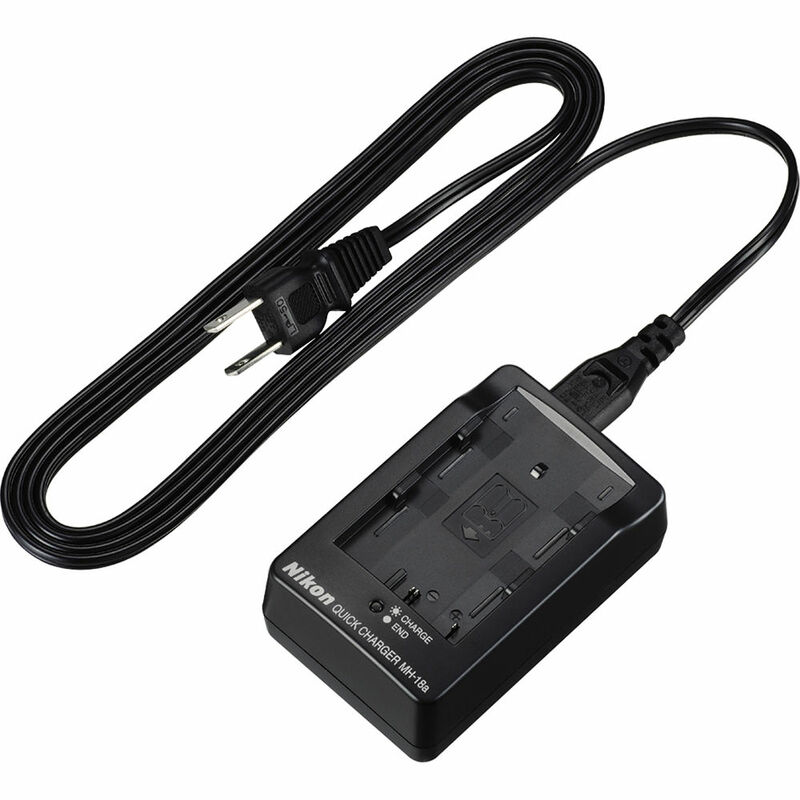 Rated 5 out of 5 by Anonymous from A Great Battery Charger from a Great Firm This battery charger is an essential part of my Granddaughter's photography gear for a D70s camera and it is a real work-horse. This particular model is not readily available; however, I can always count on B&H to have, not only the best gear, but a supply of everything a photography enthusiast needs. Our family relies on them to be there for us and they never let us down. Rated 5 out of 5 by Coach Gene from as expected Having gone without a charger, and therefore my camera for too long, it was great to get it replaced and have things back to normal. Just as expected, first rate, very good product. Rated 5 out of 5 by michael photo from Reliable product This is a reliable product that simply comes through all the time. I'm glad that I bought a second one to have around...never have to worry about losing power! Rated 5 out of 5 by Riley from great charger I tried a generic battery charger after I lost mine for my D90. It was horrible. I ordered this to replace it it charges fast and completely. Rated 4 out of 5 by DJFoto from To light or not to light? I have relied on this charger since I bought my D70 and it has worked superbly until recently when I thought all 4 of my batteries were charged up and ready to go to assist a friend who was shooting one of her first weddings. Within 15 or 20 minutes of using each of the batteries,the camera died due to the battery drain. I thought that when the orange light went out on the charger that the battery was fully charged but found out that it stays lit and constant, not flashing, when it is fully charged. I was really freaking out thinking it was my camera until I found this out. Watch your charge light. If it does not stay lit solid orange, you need to get a replacement charger. Watch for the first signs of quick drainage of your charge and replace it. Don't wait and find out too late. Rated 5 out of 5 by Anonymous from Pricy, but worth the money I lost one of my battery chargers, and played around with the idea of getting a cheap off-brand to replace it since I was a little tight on money, but ultimately I decided to go with quality. I've never had any problems with the three Nikon quick chargers that I have owned. They work wonderfully and are able to provide a consistent charge without me having to worry about how long they are going to last. It's definitely worth the money for that kind of peace of mind. That being said, I'd love it if Nikon offered a car-charger option. how do you know when charging is finished? Lens does not stick into it's camera, but click-sticks into other camera bodies. What could be the problem? hey - on my Nikon Quick Charger MH-18a, it says that it is made in Malaysia. is this the correct charger for the d90?